During the past few years, I have had - and still have - the privilege to administer one of the largest IBM Cognos BI 10.2.1 configurations in The Netherlands. The production configuration consists of 2 webserver/gateways servers, 10 dispatcher servers and 2 (active/passive) content manager servers. Each day, approximately 80,000 reports are requested and processed. Each month the system serves approx. 6,000 unique users. Substantial growth is anticipated. One of the security requirements, as demanded by the client, is to log all report and job requests. This is achieved by enabling the out-of-the-box Cognos Audit Logging to a database (Oracle). See the BI Administration and Security Guide, Chapter 5, for more information on this topic. In addition, my client not only wants to see who has run which report, but also which parameter (or prompt) values were used when running these reports. To enable parameter value logging, we added the Advanced setting “RSVP.PARAMETERS.LOG” value “TRUE” in Cognos Administration for the ReportService and BatchReportService of each requested dispatcher. This setting populates the Audit log table COGIPF_PARAMETER with records containing COGIPF_TARGET_TYPE = 'JobStepDefinition' (for job step request parameter values) or COGIPF_PARAMETER_NAME = 'parameterValues' (for report request parameter values). Note: this setting is not well known or documented! We found and applied the information from this IBM document. After enabling parameter value logging, for report requests all parameter value information is stored in a CLOB column named COGIPF_PARAMETER_VALUE_BLOB. As you might have guessed, this is XML type information. Now the challenge is: how to elegantly retrieve this information for presenting in our audit report? 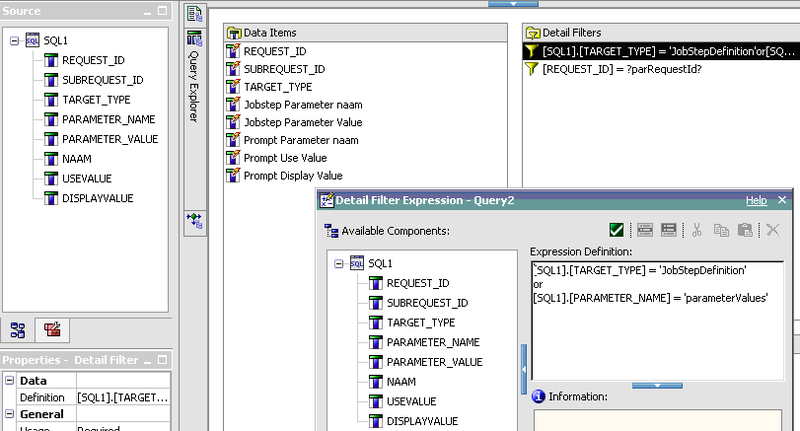 The filter on REQUEST_ID gets its parameter ?parRequestId? passed by an overview report drilling through to this parameter report. Using this type of native query was key to extract the information we need in our log reports. Please let me know in the comments below if this information was of any value to you! PS Kudos to co-worker Fred Bouwhuis for sorting this technique out! In my previous post, I've explained the technique for interactive measure reports. The user could change the measure displayed in the chart and crosstab simply by a click on the radio button list. Below this list a drill through link "Go to Analysis Report" was displayed. Actually, the reporting solution for this customer consisted of several dashboard reports, one for each type of manager. Each dashboard shows up to 6 charts (one per KPI). Clicking on a chart runs a KPI report like you've seen in the prevous post, containing the button list of measures as well as the "Go to Analysis Report" link. Clicking on this link runs a commonly defined Analysis Report. offers only the dimensions and measures relevant to the passed KPI, thus being "Contextual"
This report enables the manager (a Cognos Consumer user) to perform some analysis on his business performance without having to use Analysis Studio. This not only reduces the TCO (because no Business Analyst license is needed), but it also relieves the burden of having to learn another user interface with more functionality than strictly needed. The Analysis Report looks like this. It's an example of KPI01 having 6 dimensions related to it. Mind that the total Multi Dimensional Model (MDM) consists of 25 dimensions and 30 KPI's. Using render variables each KPI-parameter is evaluated and the relevant prompt is shown or hidden. Note also that so many dimensions and measures in the model will make this a heavy report, as it will contain a lot of code! When the user finishes the prompt pages, the report runs resulting in a crosstab. The prompts are shown in the top half of the report page itself for immediate adaption by the user (Auto-submit). Aside from the contextual features of this report, a technique has been applied to toggle display of the optional prompts. Well, I hope this may be of any use to you. In case of any questions or so, please drop a comment below and I'll follow up. The chart currently shows the number of Worked Hours, a measure that is selected in the radio button list on the left hand of the chart. When the user clicks another measure, the chart directly shows that measure, without further prompting. In this post I will show how this has been developed. This report is created in Cognos 8v4 BI, using Report Studio. The data source is a PowerCube, so some dimensional authoring is done in the report (using MUN's et cetera). This not relevant though, because I think the technique should also work with relational authoring. So now the prompt object is finished. The Expression property contains the # prompt() # macro. This will read the value of parameter P_Measure (as defined in the Value Prompt object), and applies this value an item (the so-called 'token'). In this case, the specified MUN value is used to display the according cube measure in the chart. In general, this is a very powerful function you could use in many cases to create powerful reports. You are however limited to strings in the expression provided entirely by the macro function, because the macro function cannot be combined with other non-macro functions. See the Report Studio Professional Authoring User Guide for more information on macros and expressions. Sometimes users ask me if it's possible to add comments to their report data, in order to clarify its status. Just as simple as possible, without having to use another application. Using Cognos BI, this certainly is possible. In this post I want to show you a technique I have developed using the Great Outdoors demo environment. 1. In the database, create a Stored Procedure, allowing you to update the comment column in a table record. 2. In the Cognos Framework, create a Query Subject using this stored procedure. 3. Create a prompt report prompting for the comment in a prompt page, and showing the modified comment in the report page. 4. In the list report, add a drill through to the prompt report, passing the selection values. Mind that the database user used in the Cognos data store Connection must have execute privilege on the stored procedure and update privilege on the table! Here's another example of a dashboard (or should I rather call it a scorecard? ), developed by me using a Cognos 8 dimensionally modeled framework and Report Studio. It is used by the management of an educational center to easily and quickly view the current status of the key performance indicators of the organization. Of course, the numbers used in this picture are entirely fictitious (albeit not unrealistic!). The framework consists of multiple dimensionally modeled star schema's, each with it's own regular dimensions. Common regular dimensions (i.e. the organization dimension) are related through relationships from each fact query subject to one central organization query subject. The report makes use of multiple master-detail relationships. The organization dimension is used in the master query, and is linked to each organization level query item in the detail query. In the report example, most columns displayed are from separate detail lists. So the master query delivers the drill down capability through the organization, and the detail queries deliver the indicator information. Coloring of the indicators is done by using conditional style variables. Here are some Key Learnings from the Cognos Forum 2007 (Orlando FL). I have attended this user conference together with Hugo (my colleague) and 3,005 other attendees. Learned a lot from tips and techniques during the intensive sessions and presentations from end user organizations, Cognos and partners. In this post, I'd like to share my implementation of a Cognos 8 Dashboard application with you. One remark here: the Gauge Palette values indicating the red-to-orange and orange-to-green borders, are not dynamic but must be entered as static values in the report. This is annoying as these values are changing every year. The data is queried from a single PowerPlay cube, so dimension sharing among the measures is guaranteed! I've chosen to create a PowerCube for this application in order to speed up quering (as data is already stored as aggregates in the cube, this should be performed really fast). The PowerCube is created as just simple data source of type PowerCube in Cognos 8, and this data source connection is all what's needed to publish the Package from Framework Manager. 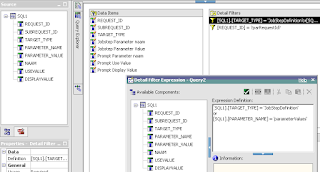 The table queries are stored in a data warehouse database and are designed really simple (star schema design), so manual SQL queries have been used here as feeders to each Transformer model data source. Of course, the user is always able to use the browser history to go back to prior pages by clicking on the Go Back drop down button in the browser's navigation toolbar! The Dashboard application, as of I blogged before, contains a navigation path ('kruimelpad' in Dutch). The navigation path is a series of one or more hyperlinks showing the path of reports a user has run from the Portal via the Dashboard down to the Monthly reports ('Marap') and the Trend graph reports. Each hyperlink in the navigation path consists of an HTML item object in the report. The '>' signs are just text item objects. The HTML item contains an anchor tag calling the browser's page history and skipping a number of pages back. Why two pages back and not one? Well, when Cognos executes a report, it will show an intermediate page "Your report is running." as long as the report is not ready and you're waiting for it. This page needs to be skipped when navigating back, so I don't go back one page but two. In case of the prior run reports 'Integraal dashboard' and 'Portal', the same code is used, but instead of -2, the number of pages back is -4 and -6 respectively. The main drawback of this technique is that Cognos does not show this page when the report can be run very quickly, so in that case the history call should be only one page back. For this potential issue, I have not found a solution yet. If someone knows of a way to elimininate the intermediate "Your report is running." page, please let me know! Cognos offers no solution for this as fas as I know.